Group-living animals are helping scientists learn more about octopus behavior. Most octopuses are loners, but larger Pacific striped octopuses, like the one shown here, display surprising social behaviors. If recent octopus discoveries have taught us anything, it’s that these eight-armed ocean dwellers are smart. They can use tools, change color in an instant, and commission their arms to solve problems. But they generally do all this as loners. Panamanian biologist Aradio Rodaniche first reported the Pacific striped octopus in 1991 off the coast of Nicaragua, noting its strange behavior—living in groups of possibly up to 40, laying multiple egg clutches, and mating face-to-face and sucker-to-sucker. Most other octopus species, for instance, come together only to mate. 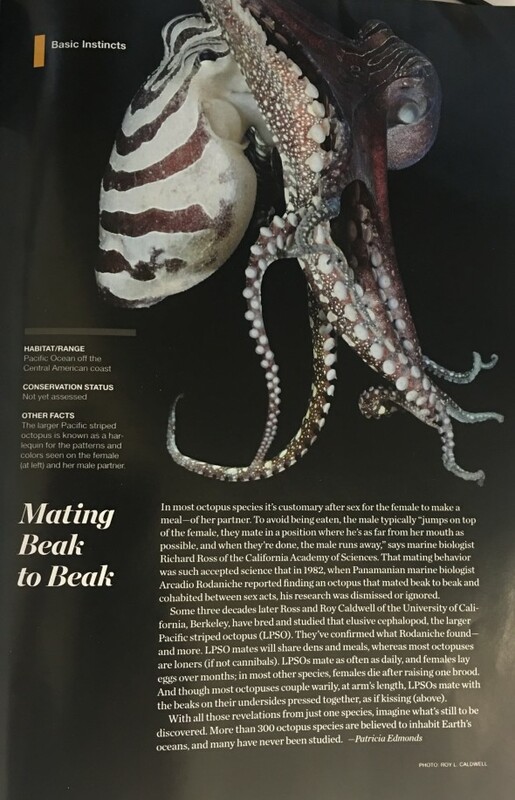 But scientists didn’t see another one of these curious octopuses for another 20 years, when Richard Ross, a biologist at the California Academy of Sciences, came across one in 2012. Through a commercial collector, he acquired several wild specimens to study in the lab. Ross is one of the few scientists who are studying and observing some of this octopus’s truly bizarre—and sometimes anxiety-provoking—behavior, which he and his team will describe in an upcoming publication.